Cancer is the second leading cause of death in the world as of 2018, with breast and lung cancer at the top for most common cancers. One-third of those deaths attributed to diet, environment and lifestyle factors, and it is estimated that up to 50% of cancers could be prevented by avoiding risk factors and implementing proven strategies. Breast cancer is mainly categorized into ductal carcinoma in situ (non-invasive, but could become invasive), invasive ductal carcinoma (represents 50-75% of cases) and invasive lobular carcinoma (5-15% of cases), and other rare categories. Subtypes include estrogen receptor and progesterone receptor positive, estrogen receptor negative and progesterone receptor positive, triple-negative breast cancer (estrogen, progesterone, and HER2 receptor negative, 15-20%) and HER2 positive. BRCA1 and BRCA2 gene mutations are tested through your physician (not in the Nutrition Genome Report), but we often discuss these genes in context with other genes in the Nutrition Genome Report to help women design a plan of action. The BRCA mutations have been associated with a 45-70% lifetime risk of breast cancer. However, as many of you have learned through epigenetics, these percentages are modifiable and are not set in stone based on diet, exercise, environment, other genes, and lifestyle. When it comes to determining the cause of breast cancer, there are individual epigenetic complexities that make it difficult to narrow down the exact reasons for each case. There are cases where it appears someone has done everything right, yet cancer still develops due to biological and biochemical flaws. 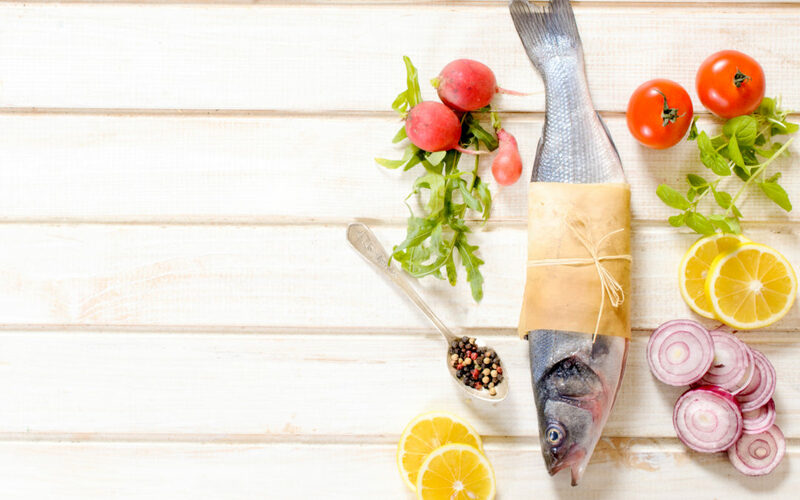 What we hope to achieve with genetic testing is an understanding of each individual’s susceptibilities with supporting research, so that we can begin to implement targeted dietary and environmental choices that are tailored to the individual. If we can take all of the known risk factors and determine the individuals’ main risks, find the genetic “chinks” in the armor, and customize their program to turn these weaknesses into strengths, we should be able to make dramatic strides in the preventative sector. A family history of breast cancer. Mutations in BRCA1, BRCA2 and numerous other genes being researched. BRCA1 mutations are associated with triple negative breast cancer. Accumulation of DNA damage from a poor diet, polluted environment, and high-stress lifestyle. Chronic stress, trauma and the link to cancer have been studied intensively for over 60 years, with a huge amount of data. The current conclusion shows a link between chronic stress and breast cancer. However, social support, genetic, biochemical and psychosocial wiring, the timing of a traumatic event, and lifestyle habits that aggravate or reduce the stress response can change the epigenetic impact. Oral contraceptives (Oral contraceptives deplete folate, vitamins B2, B6, B12, vitamin C and E, magnesium, selenium, and zinc, many of which protect against breast cancer). The research appears to show the highest risk for women starting the use at a young age. Deficiencies in folate (only in those with higher alcohol intake and potentially gene status), B1, B2, B6, vitamin C, vitamin E (except for high doses of alpha-tocopherol), selenium, zinc, choline and betaine, iodine, phytoestrogens, omega-3 fatty acids, zinc, vitamin A and vitamin D.
Antibiotic use has been linked to an increased risk of breast cancer. Iron levels and high omega-6 intake/low omega-3 ratio. Type 2 diabetes and elevated blood sugar in non-diabetics. Conflicting studies on saturated fat intake and breast cancer likely from genetic differences in blood sugar response and dioxin load. Moderate to heavy alcohol consumption in both estrogen-positive and BRCA cases. For those with BRCA1 mutations, alcohol has also been hypothesized to play a direct role in breast cancer tumorigenesis by down-regulating the tumor suppressor gene BRCA1, affecting the estrogen receptor-alpha and leading to more genetic damage. If you have the BRCA1 mutation, alcohol makes your face flush, disrupts your sleep, or you feel hungover the next day, you are doing more harm than good. Coffee consumption has been shown to reduce breast cancer risk in post-menopausal women, especially for those with the BRCA1 mutation (dark roast coffee reduces DNA damage by 23%). Compared with non-tea drinkers, those patients who regularly drank green tea during the first 60-month period after their cancer diagnosis posted a 43% decreased risk of all-cause death and a 46% decreased the risk of recurrence in triple negative breast cancer. Risk factors for Invasive Ductal Carcinoma include a family history of ductal carcinoma breast cancer, estrogen dominance from oral contraceptives, not having children, having a first child over the age of 35, breastfeeding less than 12 months, and genetic mutations in BRCA1 and BRCA2. There are still a lot of questions to answer in regards to how Invasive Ductal Carcinoma can occur and there are likely numerous variables case to case. As more women are delaying pregnancy to the late ’30s and early ’40s, more attention needs to be paid to breast health. According to the Susan G. Koman Foundation, women who have their first birth at 35 years of age or younger have a reduced risk of breast cancer compared to those older than 35, and each additional birth reduces the risk even further (especially when the births are close together). Pregnancy has a protective effect on the breasts, and whether or not this relates to estrogen positive and estrogen negative equally is being studied. Multiple studies have also shown longer duration time (over 12 months) of breastfeeding has a protective effect and lowers the risk of breast cancer (including triple negative). Women who give birth for the first time after age 35 are approximately 40 percent more likely to get breast cancer than women who have their first child before age 20. The current hypothesis for this is that DNA damage accrues as we age, and the rapid growth of these damaged cells during pregnancy can tip the scales towards increased risk. For women who had their first pregnancy after age 35 and breast cancer runs in the family, more attention should be paid to the individual requirements and sensitivities to help reduce DNA damage and breast cancer proliferation through epigenetic strategies. 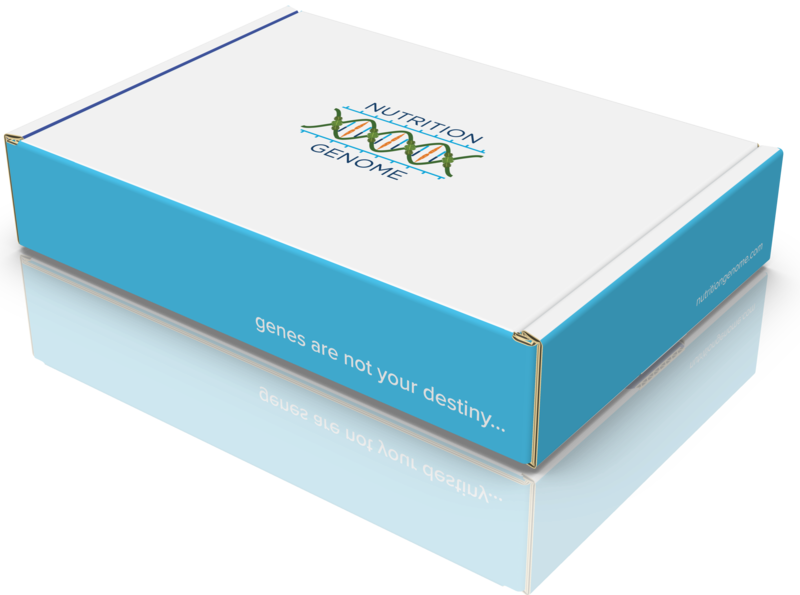 In each section of the Nutrition Genome Report, you can apply the results of certain genes towards breast health. When you have certain variants in these genes, it helps you narrow down exactly where you need the most focus. For example, you may find you have a much higher need for dietary choline than the average women due to variants in PEMT, and a much higher sensitivity to dioxins (high in animal fat like dairy) due to variants in GSTM1, GSTP1, CYP1A1, CYP1A2, or CYP1B1, requiring more strategies to help counteract the toxic effects and assist detoxification. BCMO1: Variants reduce the ability to convert beta-carotene to vitamin A, increasing the need for animal-based vitamin A. Vitamin A modulates the epigenome and reverses pre-cancerous breast cells to normal cells, but not fully cancerous cells making it most effective for prevention. NBPF3: Data suggests that oral contraceptive users have extremely low plasma B6 levels. Three-quarters of the women who reported using oral contraceptives, but not vitamin B6 supplements, were vitamin B6 deficient. PEMT: Variants in PEMT increase the need for dietary choline and betaine. Low choline intake decreases the ability of the body to detoxify carcinogens. One study found that a higher choline intake was associated with decreased breast cancer risk and a very low choline intake disrupted BRCA1 function. CYP2R1 and VDR: Variants in both CYP2R1 and VDR increase the need for vitamin D. VDR is the vitamin D receptor and is found in the breast tissue. Research has shown women with the highest quantile of circulating vitamin D was associated with a 45-50% decrease in breast cancer risk when compared with those women with the lowest quantile of vitamin D.
BRCA1 expression is also critical for mediating the biological impact of vitamin D3 in breast tumor cells, which means you have to support BRCA first before vitamin D can do its job. The optimal range appears to be between 35 and 50 ng/ml. Vitamin D can also inhibit the estrogen pathway and reduce the expression of the aromatase gene, a gene encoding an enzyme that converts androgens to estrogens. PON1: Pesticides have been linked to suppressing vitamin D levels, and variants in PON1 may increase this sensitivity. MTHFR, MTHFD1, DHFR, and SLC191: All genes should be reviewed to assess folic acid sensitivity and folate requirements. High circulating levels of synthetic folic acid found in fortified foods and synthetic supplements have been linked to a higher risk of breast cancer. Those with a BRCA mutation and high circulating folic acid had a 3.2-fold increase in breast cancer risk for high circulating folic acid. It would appear hypothetically that having your first child in your late 30’s while supplementing with synthetic folic acid combined with low zinc, selenium, and choline intake would be a recipe for aggressive breast cancer growth in those genetically susceptible. ATM: ATM is a DNA repair gene that responds favorably to folate. Variants in ATM may increase the need for folate, especially in those with high blood sugar, BRCA mutations, and a family history of breast cancer. Fasting for 13 hours or more from dinner to breakfast (BRCA mutations reduce DNA repair capability, and fasting improves DNA repair). Fasting less than 13 hours increased breast cancer reoccurrence by 36% in one study. GSTM1, GSTP1, and GPX1: All genes should be assessed for glutathione levels the master antioxidant system and protection against chemicals and toxins. Selenium is the major co-factor of glutathione, and GSTM1 and GSTP1 are connected to the lungs and breasts. FUT2: Variants in FUT2 increase the need for prebiotic fiber from a diversity of plants for a healthy microbiome, estrogen levels, and B-vitamin production. Research has proposed that the microbiome contributes to breast carcinogenesis by modifying systemic estrogen levels. Antibiotics destroy the microbiome and chronic use has been correlated with an increased risk of breast cancer. Consuming 27 or more different fruits and vegetables per week (reduces risk by 73% for those with BRC1 and BRCA2 mutations). Adults in the U.S. consume fruit an average of 1.1 times per day and vegetables 1.6 times a day! ESR2: Research has found that the probiotic strain lactobacillus plantarum has been found to significantly lower fibrinogen (high amounts can cause blood clots) and LDL, assisting variants in ESR2 which can lead to higher fibrinogen levels. Rat studies have also found that long-term administration of Lactobacillus plantarum is effective against breast cancer. MAO: The TT genotype encodes for the slow activity of the enzyme, requiring more B-vitamins to assist this estrogen detoxification. COMT: The homozygous H62H and V158M genotypes encode for the slow activity of COMT, increasing the need for magnesium to assist estrogen detoxification. CYP1A1, CYP1A2, and CYP1B1: The heterozygous and homozygous variants in these genes may increase the activation of certain carcinogens from fried meat, dioxins, vegetable oils, cigarettes, nitrosamines and aflatoxin that damage the breast tissue. in this estrogen pathway. Optimal levels of iodine and vitamin D help modulate the estrogen pathway and help prevent cancerous growth. Iodine deficient breast tissue exhibits early markers of breast cancer, and 30% of iodine stores are in the breast tissue. One of the hypotheses that Japanese woman have a lower risk of breast cancer is due to a higher iodine intake, and their breast cancer rates climb when they immigrate. Vitamin D levels should be between 35-50 ng/ml, ideally on the upper end of this range. SHBG: Variants in SHBG increase the need for fiber for women to assist estrogen metabolism. White button mushrooms contain an anti-aromatase inhibitor that inhibits estrogen biosynthesis and were found to inhibit the growth of breast tumor cells. ESR2: ESR2 is a tumor suppressor gene for estrogen receptor beta and expressed in the breast tissue. Variants in this gene may increase the need for phytoestrogens like flax, iodine, and apigenin rich foods like celery and parsley. Daily flax seed intake rich in fiber and phytoestrogens (1 tablespoon or more) and enoki mushroom have both been found to inhibit estrogen receptor positive and negative breast cancer cells. High luteolin (celery, broccoli, thyme, and parsley) and blueberry intake, both found in research to stop triple negative breast cancer cells in their tracks. ESR2, CYP1A2, GSTM1, and GSTP1 all are associated with dioxin detoxification. Avoiding or minimizing dairy (or being careful to choose clean sources) and other sources of dioxins for BRCA mutations should be a priority (see our previous article, Dioxins and the BRCA Genes: What You Need to Know to learn more about the BRCA genes and triple negative breast cancer). HFE: People who are homozygous for the HFE C282Y gene mutation comprise 85 to 90 percent of those with hemochromatosis (iron overload). There is also non-hereditary hemochromatosis that is unlinked to the HFE gene. Participants of born in Australia, New Zealand, the United Kingdom or Ireland were genotyped for the HFE C282Y variant. Compared with those with no HFE C282Y variant, HFE C282Y homozygotes were at increased risk of colorectal cancer and female HFE C282Y homozygotes were at increased risk of developing breast cancer. FADS2: Variants reduce the ability to convert plant-based omega-3s to EPA and DHA, increasing the need for animal-based omega-3’s. Omega-3 fatty acids EPA and DHA shift estrogen signaling to inhibit breast cancer cell growth. One study found that regular users of fish oil containing EPA and DHA showed a 32 percent reduced risk of invasive ductal breast cancer. TP53: TP53 is a tumor suppressor gene, and variants may increase the need for both zinc and selenium. Zinc also improves VDR function for vitamin D, glutathione, cell membrane health and PPAR-alpha. ACSL1: The GG genotype may be more sensitive to saturated fat from red meat and dairy for fasting glucose and insulin levels. APOA2: The GG genotype increases the sensitivity to saturated fat over 22 grams for weight control. TCF7L2: Variants in TCF7L2 increase the sensitivity to sugar and refined grains for blood sugar levels, and variants in this gene have been connected to breast, prostate and colon health. ADIPOQ: Adiponectin has been found to be an independent risk factor for breast cancer but not conclusive. Variants in ADIPOQ may lead to lower levels of adiponectin. Breast cancer patients responded favorably to 750mg of ginger and swimming 4x a week to increase adiponectin and glutathione levels. There is also a synergy with rosehips and adiponectin levels. Rosehip extract (1mg) reduced the growth of triple negative breast cancer cells by 50% and limited its spread by 45%. FTO: The homozygous genes affect the hunger hormone ghrelin, requiring more protein and fiber in the morning to prevent overeating throughout the day. PPAR-alpha: Variants in PPAR-alpha may have a poor response to longer fasting times and require more dietary activation to inhibit tumor growth. PPAR-alpha induces apoptosis and prevents cancerous growth in human breast cancer cells, and the activation of PPAR-alpha inhibits tumor growth. See the Nutrition Genome Report for all of the dietary strategies to activate PPAR-alpha. 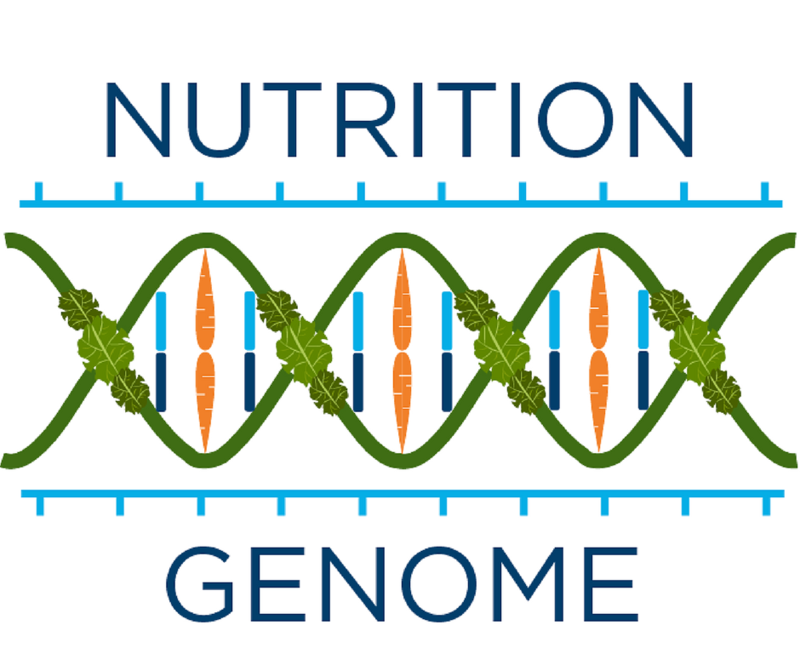 The application of the Nutrition Genome Report can be applied to a wide range of pathways to help understand how disease can manifest, and how you can be proactive to understand your individual biochemistry. 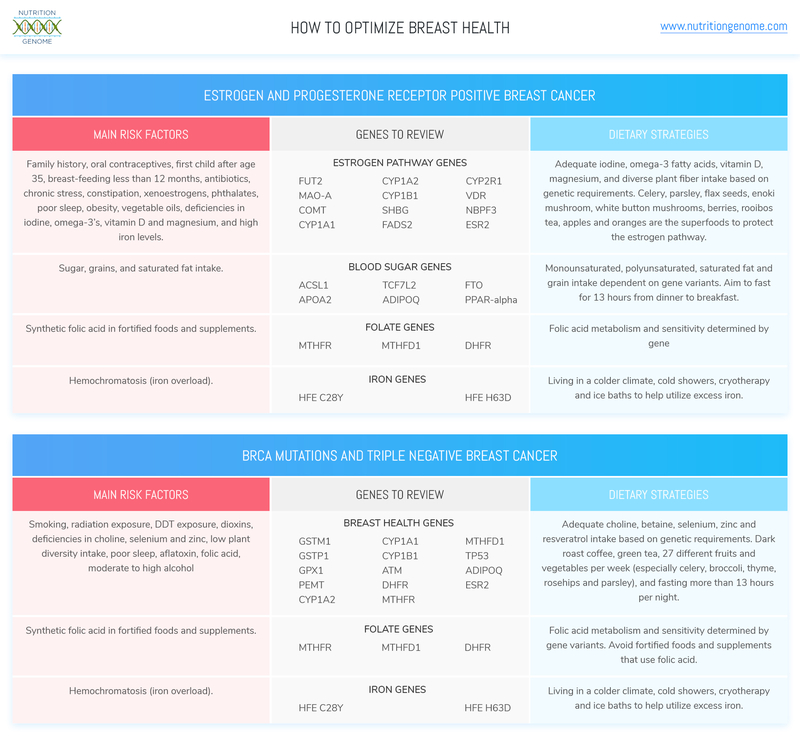 For breast health, the Nutrition Genome Report can be a phenomenal aid in helping you understand your body’s strengths and weaknesses, and how to epigenetically improve the probability of excellent health. *All of the research in this article is for educational purposes only. It is not meant to be considered medical advice. You should speak with your doctor regarding any treatment or application of the information provided here.